Maybe you’ve gotten used to the idea of seeing driverless vehicles perhaps one day casually cruising alongside your car on the highway with no one paying attention behind the wheel, but semi-trucks, well that’s a much different — and bigger — thing to get used to. 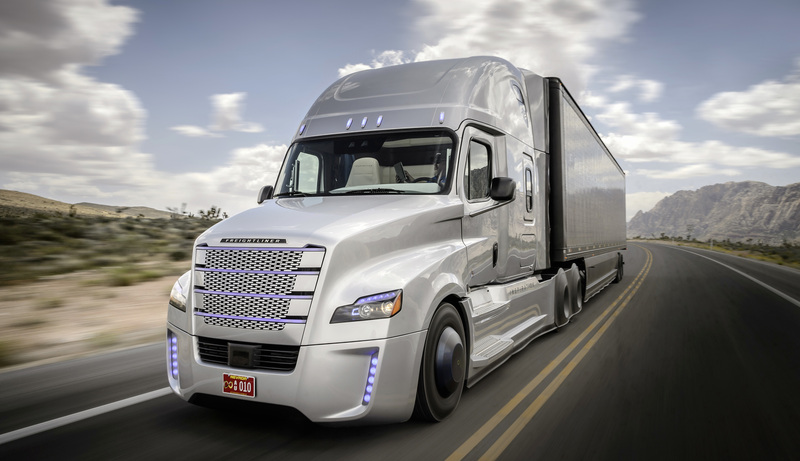 A company called Freightliner now has a license to test its autonomous tractor-trailer truck in the state of Nevada, it announced in a press release, and already has one of those trucks in operation already. It’ll begin test driving on public highways. Nevada is one of only a few states that has laws that allow for such licenses. These won’t be ghostly visions of driverless, giant semis roaming the roads, as a licensed truck driver will be in the driver’s seat, though the Freightliner Inspiration is designed to drive by itself on limited access interestates. A human driver will then take control of the vehicle when it’s in city and suburban driving situations, notes CNNMoney. Using radar sensors and cameras to stay in its lane and avoid hitting other cars, the Daimler AG-owned truck could help reduce driver fatigue, the company says, allowing them to be more productive while on the road. A driver could get paperwork done or plot out the next trip while the truck pays attention to the road. Is Uber Testing Self-Driving Trucks Without Authorization? Previous Would You Tip Your Lawyer Or Your Dentist?